Separating the iPhone App Store’s wheat from its chaff is suddenly all the rage, with Apple launching its own App recommendation Web page, and a third-party service called Yappler Sync turning app discovery into a social experience. 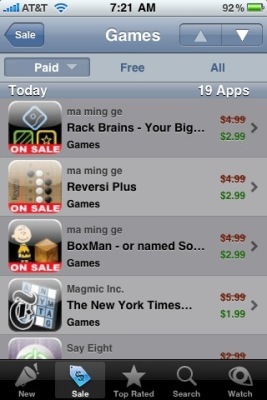 My personal favorite, App Miner is a free app that keeps tabs on price drops in Apple’s App Store so you can make sure you get in on any bargains. You can set up a watch list for your favorites, but the most useful feature is the master list of discounts. 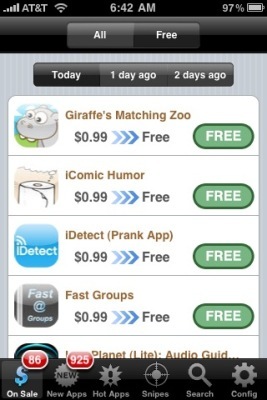 By filtering the list into free and paid apps, it’s easy to find new items without paying a dime. With all due respect to our colleagues at Macworld, we’re not sure their daily recommendations of the best apps are worth $2. Of course, App Gems also features access to the top-rated apps by category and lists of essential apps compiled by Macworld editors. If you’ve got money to burn, we’re guessing App Gems is at least more reliable than the caps lock-addled user reviews in the App Store proper. Like App Miner, AppSniper helps you find apps when they’re marked down in price. However, this app itself carries a price — it costs $1. In return, you get faster navigation than the competition and a slightly slicker interface.If you intend to find paid apps with AppSniper, it’s probably worth the initial investment. 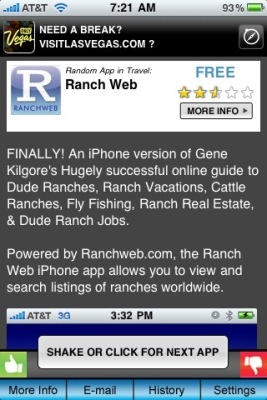 Looking for serendipity in your app search? Try out Fluke, a free tool that presents you with one random app at a time. You can filter the process by free or paid, and by category. Fluke even provides a thumbs-up and thumbs-down evaluation system, inviting its customers to advance the app by rating each suggestion. For all our gripes, the App Store is still the fastest way to search directly for apps, thanks to a smart search bar that recommends queries based on what you’re typing. And the new Genius function helps find apps that are similar to the ones you’ve already downloaded. Combined with the other apps on this list, you should have no trouble finding what you’re looking for, and what you’re not.